She calls the attack "outrageous" and says Russian President Vladimir Putin "is a thug and a bully"
Sen. Claire McCaskill, D-Mo., asks a question of Secretary of Commerce Wilbur Ross during a Senate Finance Committee hearing on tariffs on June 20, 2018. Sen. Claire McCaskill says Russian hackers tried unsuccessfully to infiltrate her Senate computer network, and says she "will not be intimidated." The Missouri Democrat released the statement after The Daily Beast website reported that Russia's GRU intelligence agency tried to hack the senator's computers in August 2017. The Daily Beast report Thursday, based on the website's forensic analysis, says the attempts were unsuccessful. 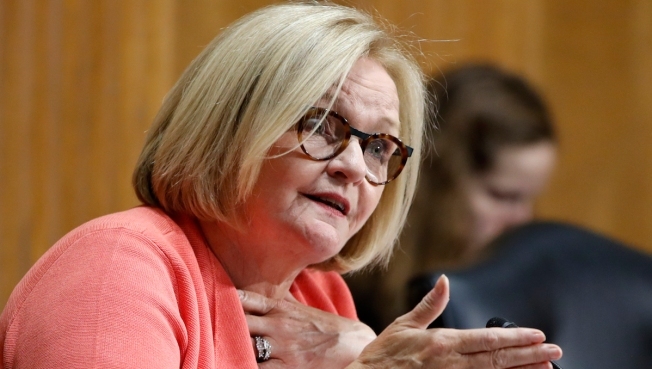 McCaskill says: "Russia continues to engage in cyber warfare against our democracy. I will continue to speak out and press to hold them accountable." She calls the attack "outrageous" and says Russian President Vladimir Putin "is a thug and a bully." McCaskill is running for re-election in 2018. Her Senate seat is considered especially vulnerable by Republicans trying to maintain their slim hold on the Senate majority.